Although related, Porcupine or Burrfishes are not poisonous, but there are many species of Puffers that do excrete tetrodotoxin. From this collection of species facts, pictures, photo, characteristic, compatibility, feeding, aquarium care, and other profile information you can learn all about Porcupine and Pufferfishes. Perlhuhn-Kugelfisch (Arothron meleagris), Tierpark Hellabrunn, München. The Brown Whitespotted Puffer (Arothron meleagris), also known as the Guinea Fowl Puffer, Speckled Puffer, Speckled Balloon Fish, Golden Puffer, and Fugu has the ability to inflate by inhaling air or water. This is a protective defense that Puffers have which prevents them from being eaten by other fish. When it expands and inflates itself, a predator finds it difficult to swallow or get its mouth around the fish. When inflated, this Puffer's body has a soft prickly texture, which is harmless to the touch. The Brown Whitespotted Puffer can grow to 14" in length. It eats a wide variety of marine life, but it feeds mainly on tips of branching corals and to a lesser extent on sponges, mollusks, bryozoans, tunicates, algae, crabs, shrimps, and detritus. In captivity, it may not be quick to adjust to tank fed fares, because of its coral diet preference. However, once adjusted it may accept freshly chopped or frozen fares, such as shrimp, crab, squid and fish, and possibly herbivore fares. Of course, it is not suitable for reef tanks. White-spotted puffer (Arothron hispidus) being cleaned by Hawaiian cleaner wrasse (Labroides phthirophagus). 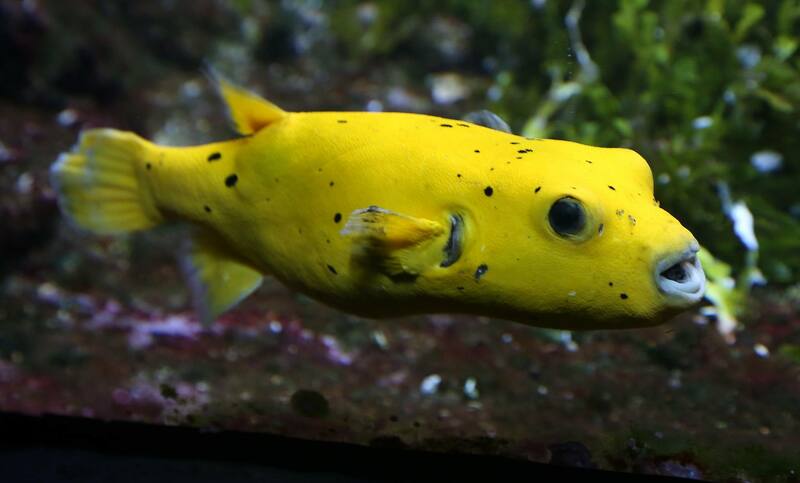 The Green Whitespotted Puffer (Arothron hispidus) will adjust well to aquarium life and eat in captivity. It has a slow going, friendly, and personable demeanor, but of course, the downside to this fish is the toxin it can exude. As we said, it is suggested for a fish-only tank community with fish that have the same or similar traits. The Green Whitespotted Puffer is an omnivore, eating a wide variety of marine life, such as fleshy, calcareous, or coralline algae, mollusks, tunicates, sponges, corals, zoanthids, crabs, shrimps, tube worms, and echinoderms, as well as detritus. Freckled Porcupinefish (Diodon holocanthus), Wakatobi Dive Resort, Indonesia. This amusing fish makes a great pet. The Spiny Porcupinefish (Diodon holocanthus) will quickly learn to take hand-fed foods. As cute as it is, unfortunately, it is not considered to be reef safe as it has an appetite for snails, crustaceans and small fish. The Porcupine Puffer has spiny appendages which cover most of its body. The spines and body colors may vary from light gray to mottled tans, sometimes with dark spots. It has 2 teeth, one on top and another on the bottom. The Porcupine Puffer doesn't have pelvic fins but uses its pectoral fins to move about. Valentini's sharpnose puffer (Canthigaster valentini). The Valentini Puffer (Canthigaster valentini) has the ability to inflate by inhaling air or water. This is a protective defense that Puffers have which prevents them from being eaten by other fish. When it expands and inflates itself, a predator finds it difficult to swallow or get its mouth around the fish.